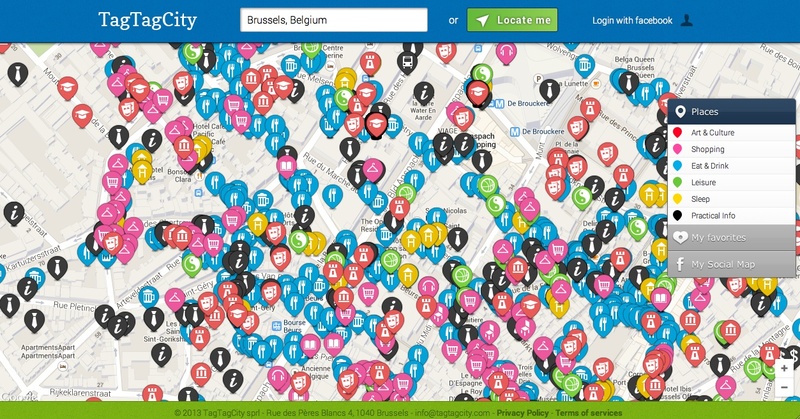 TagTagCity is a recent start-up launched by the cofounder Geoffroy Simon in Brussels in 2011. The idea is born considering the fact that it’s quite complicated and time demanding to obtain sufficient and relevant information about a city, such as the location and basic information about restaurants, hotels, shopping, culture and touristic places, etc. This problem is encountered either by tourists visiting a city, or simply by citizens living in a city. Even though loads of information is actually available, either on guidebooks, on tourist brochures, on diverse websites or simply using word of mouth, it may often become very inconvenient and difficult to use and integrate all these different sources of information while walking on the streets of a city. TagTagCity brought in an efficient solution to that particular problem. Their main idea was to centralise all this information on a single world map, online. This idea resulted in the implementation of a two-sided online platform presented in the form of a Google world map. On the first hand, any business owners could tag the location and basic information about his business on the map for free. On the other hand, any user could simply go on the website,access the map for free, and benefits from all the information tagged on it. The users has two basic options, either he enters a specific place in the world to check on the map, or he asks the website to localize himself to check nice places around him. This platform has been a total success mainly to the fact that it brings together two groups that are naturally attracted by each other, namely tourist and citizens as the users, and business owners as the taggers. This enables the platform to benefit from a natural network effect. Furthermore, cross-side network effect has also a great positive influence on such platform. Indeed, the more businesses are tagged on the map, the more interesting it is for users to consult it. It also works in the reverse way, meaning that the more users regularly use this platform, the more interesting it is for business owners to tag on the map. However, too many tags could also result in negative impacts know as a same-side effect. Indeed, too many tags of businesses in a certain region could result in a saturation of the offer on the map, which will reduce the incentive of business owners to add their own business on the map. Furthermore, too many tags on a certain city could also considerably reduce the efficiency of the map, as observed on this image. In addition to facilitating transaction and interaction between two groups in the market, this platform also results in the creation of a valuable worldwide “social map” constantly developed and maintained up-to-date by any people in the world. All this success raises the interest of potential investors. Indeed, the start up has recently risen up 1,5 millions euros from some French and Dutch investors. The giant Facebook, with who TagTagCity has recently made some features links, also seems quite interested in acquiring the start up. TagTagCity has not stopped there and is now implementing a special tool for business owners to develop their own mobile website. The idea is that instead of simply posting the location and basic information about their business on the map, business owners could develop, with the help of TagTagCity’s tools, a special website page much more detailed for a fix one-time payment of 60 euros. As we may see, TagTagCity seems to have become an expert in getting their customers involved in developing and creating their own products.